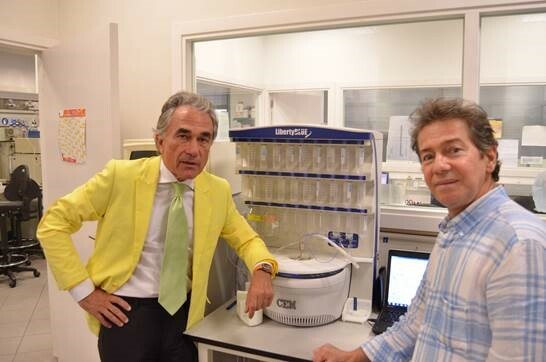 Professor Fernando Albericio is a globally recognized pioneer in peptide synthesis with research covering all aspects of peptide synthesis and combinatorial chemistry methodologies. In 1981, he received his Ph.D. from the University of Barcelona under the supervision of Prof. Ernest Giralt. Subsequently, he completed postdoctoral work at Tufts University, the Université d’Aix-Marseille, and the University of Minnesota. In 1994, he received the Leonidas Zervas award from the European Peptide Society. Since 1995, he has been a Professor at the University of Barcelona and Group Leader at the Institute for Research in Biomedicine (IRB) . To date, Prof. Albericio has published more than 750 papers, co-authored 3 books, and holds more than 50 patents. The Albericio group has recently been active in improving the coupling process during solid phase peptide synthesis cycles. Some of his recent work includes highlighting the effective use of 2-methyltetrahydrofuran (2-Me-THF)1 and tetrahydrofuran (THF) or acetonitrile (ACN)2 as more environmentally friendly solvent replacements for DMF. Additionally, an improved coupling involving the hydrochloride salt of 1-Ethyl-3-(3-dimethylaminopropyl)carbodiimide (EDC) with the potassium salt of the Oxyma/Oxyma-B additives were disclosed3. Furthermore, a Tetrahydropyranyl (Thp) side chain protecting group for cysteine was recently used that showed improvements toward epimerization and C-terminal 3-(1-piperidinyl)alanine formation4. Advantageously, the Thp protecting group shown in Figure 1 also improved the solubility of cysteine containing peptides compared to the traditional Trityl (Trt) protection. Together, these improvements offer important advancements toward green peptide chemistry and enhancement of synthesis quality.